Great classes and lots of new fabric! The Foothill Quilters Guild quilt show, "Wish Upon a Star", will take place Friday and Saturday, March 28-29. It is held at the Gold Country Fairgrounds in Auburn, and we will be a vendor again this year. BOM-Anniversary Waltz (full), Thu, Mar 12, 10:30 - 11:30 a.m.
-OR- 5:30 - 6:30 p.m.
Sue Spargo's Bird Dance (full), Sat, Mar 14, 1:00 - 4:00 p.m.
Handwork Sit & Sew, Mon, Mar 16, 10:00 a.m. - 4:30 p.m.
Blankets for Preemies, Fri, Mar 20, 11:00 a.m. - 3:00 p.m.
Saltbox Farm (full), Mon, Mar 23, 9:00 a.m. - noon -OR- 1:00 - 4:00 p.m.
American Girl Doll Sit & Sew, Wed, Mar 25, 1:00 - 4:00 p.m.
Beginning Needleturn Applique (full). No classes in March. Handpiecing-Bears & Berries (full). No class in March. 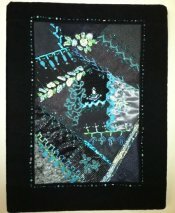 Machine Quilting with Your Walking Foot, Beth Kondoleon, Sat, Mar 7, -OR- Fri, Mar 27, 10:00 a.m. - 4:00 p.m., $40, supply list. Come join Beth as she shows you how to quilt with your walking foot. You will learn some basics of the walking foot, then move on to do some matchstick and crosshatch quilting. We will explore using some of your decorative stitches along with quilting some curves, circles, and radiating designs. Beth will demonstrate which templates you can use to make life easier. So come join the fun and start quilting those tops! 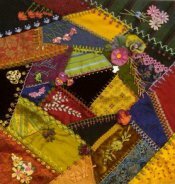 Beginning Free Motion Quilting (evenings), Dana Lahargoue, Wed, Mar 11 & Mar 18, 5:30 - 8:30 p.m., $40, supply list. In the first session, you'll learn machine set up and basic shapes and backgrounds and will have lots of time in class to practice. In the second session, you'll take your new found skills and put them to work on a continuous line design which you can use as a small wall hanging or pillow. Crazy Quilting - Beginning, Toni Jordan, Sunday, Mar 29, 11:00 a.m. - 3:00 p.m., Sunday, Apr 12 & 19, 11:00 a.m. - 1:00 p.m., $60, supply list. In the first session you will construct a 14" block using a wide variety of fabrics; cottons, silks, tapestries, velvets, linens. In the second session you will start the embellishments. You will learn a variety of embroidery stitches using different threads and techniques. In the third session, you will learn more embroidery stitches and embellishment techniques using buttons, laces, jewelry and other "finds". We've received lots of new fabrics with beautiful designs, including kids prints, kitchen prints, sewing-themed prints, florals, novelties, blenders, and more. Come in and see them! Downton Abbey Egyptian from Andover - We love Downton Abbey, and didn't think the previous fabric collection from Andover did the show justice. This one, however, is very pretty! Kotori Ducks - A beautiful Asian line from Hoffman. 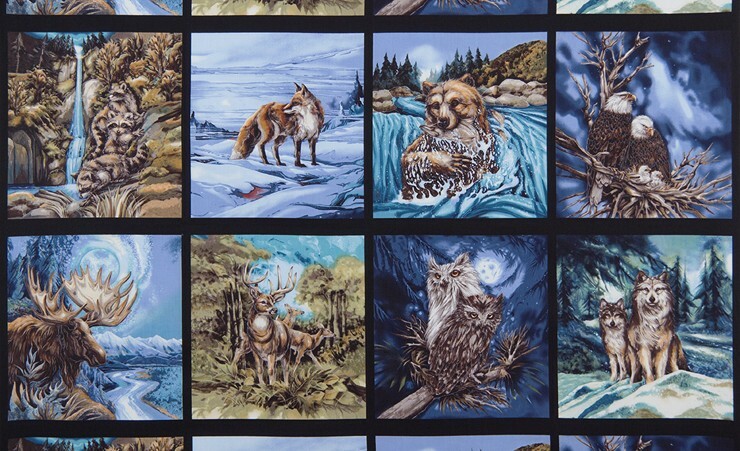 North American Wildlife 3 - Robert Kaufman has done it again with their third wildlife collection. It's beautifully done and includes amazing coordinates. Other new arrivals include Earthly Delights from Westminster, Aurora gradated batiks from Moda, Dog Park from Studio e, Monkey Around from Henry Glass, Bear Hugs from Fabri-Quilt, and several new silk dupioni colors. We also have many new wonderful tonal blenders from several companies. For you hand-work enthusiasts, we have new colors of Silken Pearl and Seagrass, and more threads are on the way. And lastly, we have a new wool kit - Spool Critters from a pattern by Bird Brain Designs, and we've made more kits of Eggs on Parade, another Bird Brain Designs pattern.